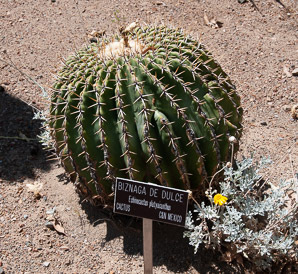 Biznaga de dulce (roughly “sweet thorny cactus”) is native to northern and central Mexico. Identification: These cacti are generally spherical in shape, though they may appear more columnar or barrel-shaped. They reach 20-98" (50-250 cm) in height, and 16-31" (40-80 cm) in diameter. The number of ribs varies from as few as 5 to 60, with spine groups of 8-10, each 1-1½" (3-4 cm) long. Spines are yellowish or reddish, darkening as they age. 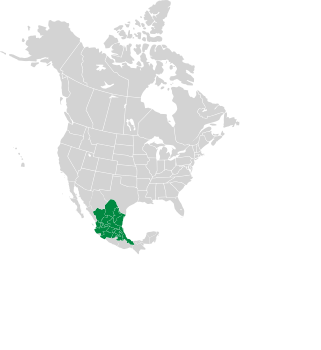 Multiple yellow flowers appear on the top of each cactus, each 1¾-2½" (5-7 cm) in diameter. Dry, oval-shaped fruits are 1¾-2½" (5-7 cm) long. The primary identifying feature is the large size. Echinocactus platyacanthus description by Thomas H. Kent, last updated 12 Oct 2018.